As I understand it, I am not allowed to donate blood. I have the British Government to partly thank for this dilemma. It so happens that I resided in Great Britain during the years when Mad Cow Disease was in its very early stages. I say, “partly thank” because even though MCD began to develop in their herds on their watch, no one forced me to eat a Steak and Kidney Pie every other night in the corner of a cozy pub, over the course of a year. That part was my uninformed choice. Anyway, I can’t give blood. I didn’t go to England on a dare. I didn’t go on a whim, or to escape a vengeful husband or boyfriend, to evade charges of mail fraud in Utah, to finish my thesis on John Keats or to search for that mythical British bar-wench who still remembered what a low cut serving blouse was for (although I admit I was somewhat curious about that last one). I went because it was the only way, I thought at the time, to keep my sanity from slipping away from me and allowing me to fall into a dark place. The root causes that led me to England happened years earlier. 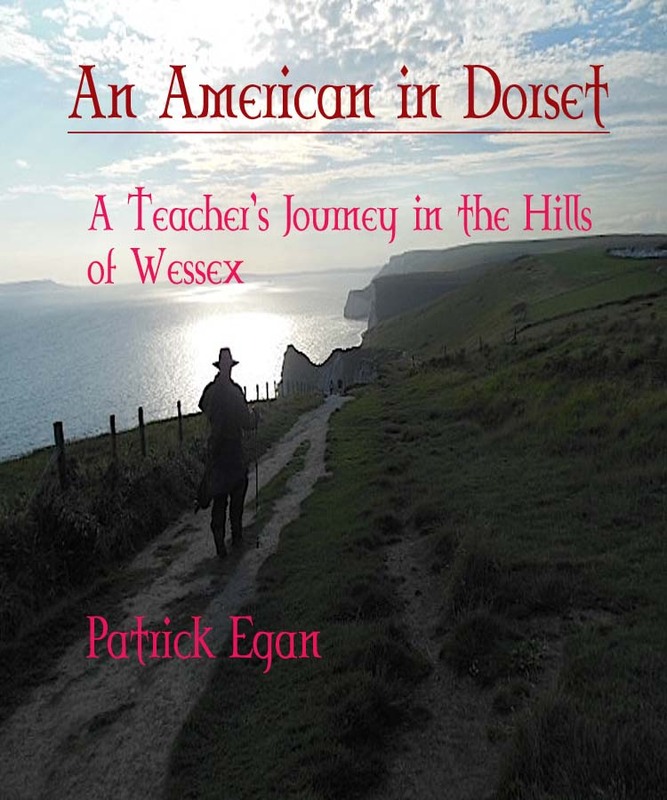 I had been teaching in public schools for seven years followed by another three at a private school in New England. During my time in the public school, I often felt humiliated, oppressed and undervalued on an almost daily basis. To be sure, this is and was an old complaint among educators. I was on my way to class one afternoon. The late bell had already sounded. I was tardy for my own class because I had felt the need to slip down to the “teachers lounge” for a cup of tea. This “lounge” was actually a section in the basement of the boiler room of a building erected in 1908. The few times I had sat at the faculty worktable to have a tea, I could hear the flush of every toilet in the building as the water gushed through the pipes over my head. This building, I should mention, was designated for the ninth grade only. Just outside my classroom window was a new $10,000,000 facility for grades ten through twelve. I climbed the five flights of stairs to get to my room. On the way, just outside my door I ran into a student who belonged at his desk in my class. He already had several clashes with the law and his dislike of me was palpable. I touched his elbow and said, “let’s go”. At that point he jumped me and began swinging. I crashed against the lockers and kept my head turned away as he swung at me to avoid having my glasses smashed into my eyes. We banged against one wall of lockers and he swung me across the hall. We both collided against another set of metal doors. A guidance counselor leapt from his hallway desk (we were short on offices) and pulled him off me. Ten seconds later I was standing in front of my class; they were clueless as to what had happened, and I tried to appear “normal”. I leaned against my file cabinet and looked down at my hands shake like one stricken with palsy. I decided to file charges for assault. I felt strongly that teachers needed protections and it was up to me to send a strong message. This was the only way I could do it. The Principal declined to support me. The teachers union turned their back on me. In the end I went to the Magistrate alone. I recall sitting in my car in the parking area of the courthouse listening to Billy Joel’s “Piano Man” and agonizing over what I was about to do. This kid was already neck deep in trouble with the school. Was I saving and serving my profession or was I burying this boy further into adolescent hell? I settled out of court. I headed the offending student off at the door. “Would you come with me for a moment?” I asked. I led him to the Vice Principals office located down the hall. We stood before his desk and I explained what happened. “Well let’s see what’s in your sock,” the Administrator said. Out came several items of drug paraphernalia, a pipe, some papers and a baggie of what I suspected was weed. My job being done, I returned to my classroom. I had a free period. As soon as I sat down, I heard the yelling and running. “Get him!” screamed the Vice Principal. I stepped out of my room only to catch a glimpse of the student running past me and toward the stairwell. He descended two stairs at a time. He reached the ground floor porch before I did, but I was in time to see him throw several items into the field near the school. It was over in a minute. The student was led away and I spent the rest of my free period poking through the brush. I found the pipe and bag of “weed”. My class schedule went something like this: I had five classes of ninth grade Earth and Space Science. Each class had about thirty students. Consequently I would find myself teaching the same topics, repeatedly, to about one hundred and fifty kids. There were no lab facilities at all. I had to meet my classes in different locations for a few years. In some of these old and creaky rooms I would hear my own voice bounce back at me from the rear wall. I did not like the echo I heard. I bored myself and could not help but wonder what these kids thought of me. I should say in all fairness that the school district was recovering from a devastating flood in 1972 and class sessions had to be arranged according to what buildings were repaired and which ones were destined to be leveled. What I had come to feel as a growing irrelevancy of my professional life hit me hard one fine day. To earn a few extra bucks I signed on to do “homebound” teaching a state mandated system set up to instruct students who couldn’t be physically in the classroom for one reason or another. One afternoon, I was at the home of a sixteen-year-old girl. Her mother was puttering in the kitchen. I sat at the girl’s desk in her bedroom and was in the process of teaching her about the formation of clouds as a function of condensation. This girl was about five months pregnant. She probably would not be finishing school. She sat and listened quietly. She was a nice girl, very polite and attentive. I stopped midway through my fascinating description of cloud formation and drank some water. During this short break, I asked myself about the quality of this girl’s future and, more to the point, what the hell clouds had to do with anything relevant at this point in her young life. She earned an “A” for simply not putting a carving knife into my chest. So, that is where I found my emotional self in the late 1970’s. I drove an orange MG Midget at the time. My mind and hair should have been blowing free and easy to the disco rhymes of ABBA pulsating from an 8-Track player bolted securely below my dashboard. As the useless sense of my life grew within me, I began to dread the long drive to the school from the farmhouse where I lived. I needed to leave the house about 6 AM. The number of the mornings began increasing when I stopped listening to the radio. Instead I would pull off to the side of the road at 7 AM to weep hot and painful tears. The fear in me was growing and spreading like a tumor of the soul. I wasn’t afraid of the kids. Most of them liked me. That’s not what made me cry at dawn. Instead, I was terrified by a life that seemed to trail off somewhere into future time ending on a hill near a tree in a pasture, or an empty seat at a honky-tonk bar at 4 PM, or later against a rusty concrete bridge abutment. What took me from that place, wiping away my tears in an orange MG Midget to a teacher’s desk in Dorset, England several years later? That’s the story I wish to tell. Available in Kindle form from Amazon. It’s all over now. The last of the news vans pulled out this morning. Left behind are only a few stringers, standing in the front lawn or the cemetery, microphone in hand, filing useless bits that will be used to fill in the time between the weather update and results of the county Pumpkin Queen Contest. I’m also one of the last to go. I’m sitting in my room at the Days Inn. If I raise the blinds, I have a great view of the street that, only a few days ago, was choked with mobile news units with two-story high antennae. The rest of us are left with station wagons, no sound or camera crews…or just a rented Chevy and a laptop. I turn off the TV, pull the vinyl chair to the window and pour a half glass of Dewar’s. I raise the blinds about a foot and begin to piece together the life lived out in full view of millions in newspapers across the country. But also lived out in near total privacy. It is left for the historians to have the final word, but for me, in the here and now, I only have sketchy facts, a few interviews and not much else. You see, Mister Dagwood Bumstead passed away, in his sleep, four days ago. We followed his antics daily (and in color on Sunday), but what did we really know about the man and his life? 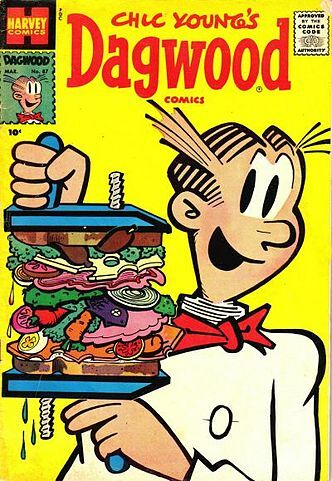 Dagwood was born ninety-some years ago in Missouri. He was the son of a very wealthy industrialist, an only son, so his future was assured. That is until he began to hang out in the dance halls and watch the dancers and flappers tap their way though the 1920’s. One flapper had his eye. Her name was Blondie Booopadoop, at least that’s what she was known by in her profession. Her real name is lost. Blondie was what all the guys dreamt of when they dreamt of glamour, laughs, fun and forgetting. Dagwood, it seems, knew nothing of the way Blondie had her eye on him as well. They dated, they married, and they passed from obscurity to a kind of fame few would experience. Their domestic life, good and bad, was chronicled in the dailies across the Depression landscape of America. The marriage itself was a turning point in their lives, and it was not toward the sky. Dagwood’s father was against the union from the start. After all, Blondie was a flapper and this was below the station the elder Bumstead had in mind for Dagwood. He informed the engaged couple that if the marriage went off, he would disinherit Dagwood and cut him off from the family fortune. Love is blind, they say, so the two married despite the parental threats. To show Blondie what a great time was in store for her, he wrote the honeymoon check out himself. It was a day too late, for Senior had cut off any funds to Dagwood. The check bounced. The Bumsteads were forced to enter the life of the working middle-class. Such a shame for a guy who was ranked second in the Country Club Tennis Team. Dagwood obtained a desk job with the famous J.C. Dithers Construction Company, Inc. based in Joplin, Missouri. Dagwood and Blondie settled into a modest ranch in a suburb. In 1934, their first child, Alexander, was born. When the War broke out in 1941, J.C. Dithers had secured several vital war-time contracts, so Dagwood was prevented from enlisting and being drafted. Their daughter, Cookie, was born in 1941. The family lived out the war years in relative obscurity until a writer fellow who also drew sketches, began hearing of the life of Dagwood. Bumstead, was bored silly at his desk job and was often found asleep on the job. He was also fond of playing practical jokes on his co-workers, but these mostly backfired. He was beginning to gain a reputation as a goof-off and here-do-well. Oddly, while Dagwood’s head of family diminished, Blondie began to come into her own, as they say, and started making important decisions…while letting Dagwood think it was his idea to begin with. She became fast friends with Mrs. Dithers, Cora. Perhaps thats why Dagwood never got sacked for his constant demands for raises with little work to back it up. Exactly how these exploits were fed to the writer remain something of a mystery. A little information can go a long way when you have only four small panels a week to work with. Researchers have tended to look closely at Dagwood’s next-door neighbor, Herb Woodley. Herb and Dagwood had a love-hate relationship. Many of their joint adventures would end up as brawls. It was during these times that Herb probably fed details to the writer. In general, Dagwood disliked animals. But for reasons known only to him (and the dog?) he bonded with the family pet, Daisy. Maybe it was because Daisy refrained from being judgmental about Dagwood? Amazingly, it wasn’t until the 1970’s that Dagwood’s lifestyle began to catch up to him. He developed a mild heart condition. Years of lengthy naps in the afternoon and his famous nighttime raids to the ‘fridge to make sandwiches large enough for only a reptilian disengaged jaw joint could eat began to slow Dagwood down. He retired from the Dithers Construction Company in the early sixties and spent the next three and a half decades reading, trying to learn the piano and watching sports on ESPN. The end came several days ago when the old man died peacefully in his sleep, on the sofa. The funeral and graveside services were well attended. The honorary pall-bearers were: his son Alex, still limping from a wound suffered in Viet Nam in 1969, his daughter, Cookie, now a retired day care worker who had moved away to Des Moines, an overweight Elmo Tuttle, who as a boy, loved to pester Dagwood to come out and play games in the yard, (something Dagwood ended when he felt the neighbors might get the wrong idea about a middle age man and young boy…well, you get it), the retired mail man, Mr. Beasley, Lou, once the owner of Lou’s Diner, (Lou stopped having the cigarette hanging out of his mouth every day once he developed Emphysema but never tried to hide the tattoos that covered his arms),and Alex’s son, Dagwood’s grandson, his pride and joy. Well, that’s the story. Much of what I just wrote is easily found on Google. It’s a testament to an Everyman who is loved and studied by scholars and other Everymen. I have to pack now, the rental car is due back in a few hours. I plan on driving slowly past the Bumstead house where the drapes are black and the curtains are shut. I also plan to swing past the cemetery and lay a flower at the blank half of his tombstone. The other side of the stone reads “Blondie Boopadoop Bumstead”. Now, that’s an all together different story.